Share trading is considered as one of the most risky ways of earning money in short time because it requires skills, knowledge as well as luck to be successful trader. Share trading can be bifurcated into three categories Investors, Swing traders and Intraday traders. Investors are the one who follow fundamental analysis and invest in company having strong numbers. The fundamental analysis includes P/E ratio, EPS, Debt to Equity, Interest Coverage Ratio etc. Investors hold shares for a long term ranging from 3 years to 10 years. We have lots of example of successful investors who have taken share trading as a profession and became billionaire such as star investor Rakesh Jhunjhunwala, Radhakishan Damani etc. Swing trading and Intraday trading can be termed as cousins because both trading practices aims to make short-term profits based on technical analysis aka price fluctuations in the market. While day trading involves buying and selling in a same day, swing trading means buying and holding stocks for few weeks before selling to take advantage of rally. I have also started share trading few months ago. Without guidance and required skills I jumped into share trading and fortunately got some serious bucks in few weeks. But then comes the ?Black Monday ?August 24th, I have lost all my gains as well as was forced to shed huge money from my pocket too. 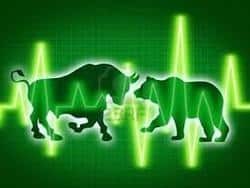 That time I have started reading online about share trading and got to know some useful tips which I am sharing here. These tips are the key principles of the legendary trader Jesse Livermore. The first and foremost principle of share trading is to never borrow capital to invest in share market. Also the capital should not be the part of your core savings. It should be your idle cash sitting in FD or savings account with no certain use. Read: Why you should not invest in Fixed Deposits? Trend is your Friend and you should flow with it. However, instead of investing all your money at once, you should spread it in equal intervals to minimize your chances of making loss. For example suppose you want to buy 800 share of SBI. Start with buying 200 shares and then see the trend of the stock, if it keeps rising than buy the next lot of 200 and if the trend continues than buy the remaining 400 shares. This way you can increase your chances of booking profits. Worst mistake of share trading is putting all your eggs in one basket. You should choose shares from different sectors to avoid getting trapped and minimize your chances of making loses. Suppose you have Rs.2 lakhs to trade with, so rather putting all your money in one sector say banks, spread it in at least 4 shares of different sectors. Such as going with SBI, Sun Pharma, Airtel, ITC rather than sticking with only one sector. Read: How to maximize mutual funds returns through SIP? Do not stick with weak stock. Capital Protection is very important for trader to survive in share market and if you find your invested stock is falling beyond 10%, exit from it straightway. Also the key to success is a stop-loss order. Stop-loss restricts your losses at certain level. Suppose you are buying a share of Rs.100 and set a stop loss at Rs.95, than as soon as the share price hit Rs.95, the share would be sold automatically and your looses would be limited to Rs.5 only. While entering in a trade you must decide the amount of loss you are willing to take. Another important rule is to exit from your positions if you brokers calls and asks for more margin money or cash due to reduction in stock price. Share trader should never average out and become involuntary investor. He should rather book losses and wait for the right time to enter again. Market keeps providing opportunities to buy quality stocks below their fair price but you can take benefit only if you have enough money. On 24th August many quality stocks nosedived and gave window of opportunity for share trader to earn handsome money. This opportunity was grabbed only by the traders having enough cash reserves. Few of the stocks were jumped as much as 30% within few days such as YES Bank made low of Rs.590 on 24th August and currently it is trading at Rs.770. But do also remember, if you miss a good opportunity, don?t worry market will give another chance. Never do baseless trading or illogical trading. Also stay away from trading purely based on some news because it takes few minutes for stock price to adjust to any news. You should have some solid reasons to enter and exit from stock. Just because stock is gaining little momentum and appreciated a few points is not the reason to sell it. Till the time overall market and stock does not show weakness, hold your positions. The golden rule says cut your losses and let your profits run. Further, don?t be too greedy, you should decide the amount of profits you wish to make before entering into any trade. As soon as the profits are met, sell half of your shares and book profits. This way you can cherish the rally as well as maintain the cash reserve. Volatility means Beta i.e. fluctuation in price of share in comparison to stock market. Let?s say stock market is up by 2% and your stock is also up by 2% than it is said that Beta of your stock is 1. Similarly if the stock is fluctuated twice the movement of stock market, than the Beta of share is 2. Trader should trade with the stock having Beta less than 2.5 because chances of high volatile share to trigger the stop-loss is very high and you would be making losses in your trades instead of booking profits. Do you think you can immediately start share trading with all these tips? The answer is big “NO”. One needs to have discipline and should develop few skills, including the ability to understand technical chart and analysis before beginning share trading. Always Remember ?Trading is a simple process, but not easy?. thankyou so much for writing this article. share market is a place people lack knowledge of, but this article has the ability to clarify it to a huge extent. keep writing. 1.During inflation i.e when price of conmodites are high and vice varsa..
Me being a beginner, this article will help me to get started. Getting valuable tips from such an article proves beneficial for investment purposes. You could get similar tips from a stock market expert like Arvind Bajaj who has a great sense of market timing and his understanding of the market makes him a sought-after advisor in the field of stocks. Do utilize his services and see the profits multiply! If I invest 600000 lac in one stock for short time trading. Suppose stock price 30/= I brought 20000 stocks. After that stock a little move on 31. In very short I will got 20000 profit. I think this is good but if I work hard before enter in stock. Especially technicalities of chart. I am a beginning for trading.need some good tips for intraday trading.Thank you. 8. Trading is a full time job. Don’t do it if you can’t stay with the market for the entire day. 9. Track leverage very closely. One wrong trade can wipe out a years worth of trading profit. 10. Discipline – unless you follow strict rules, you will lose your shirt. 11. Learn, Learn, Learn. Analyse failed trades as well as successful ones. 12. Never kid yourself that you understand the market. Some tips about Intra Day.